From 2008-2010 I was involved with the study, treatment, and analysis of Syrian painted interiors from the Ottoman period. My main research focused on understanding the materials present in the decorative 'ajami layers in the then-called Nur al-Din room from Damascus at the Metropolitan Museum of Art and reconstructing two specific panels from the room to illustrate what the original colors and overall feel would have been. This video produced by the Met, called "True Colors: The Damascus Room," gives a nice overview of the panel reconstruction project. You can also click to see the poster I presented at the 2010 IIC Congress in Istanbul. Damascus Room, dated A.H. 1119/A.D. 1707, from Syria, Damascus, wood, gesso, metal leaf, glazes and egg tempera paint, mother-of-pearl, marble and other stones, stucco with glass, plaster ceramic tiles, iron, brass. MMA 1970.170. Image courtesy of the Metropolitan Museum of Art. 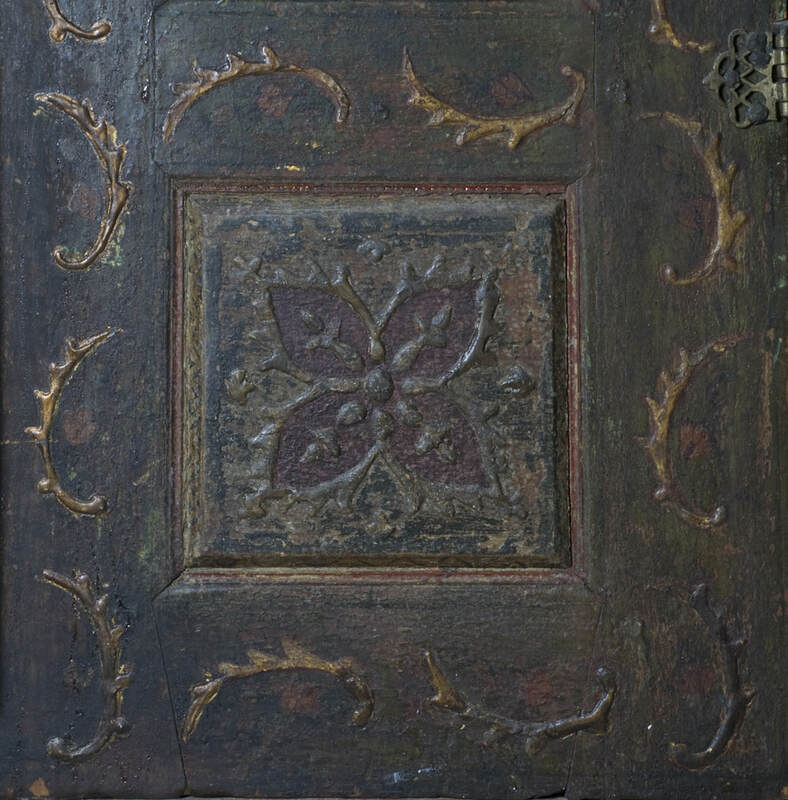 The traditional art and craft of decorating Syrian interiors in the 'ajami style and technique was first used in the Mamluk period (13th-16th centuries) and flourished in Syria in the Ottoman period through the early nineteenth century. Even before the devastating civil war began in 2011, knowledge of the craft was becoming lost in Syria. There were only a handful of people interested in carrying on the technique and applying it to site preservation. Due to collecting trends of the nineteenth and twentieth centuries, architecture from Arab lands can now be found in museums and collections all over the world. While dislocated from their original contexts, these rooms represent some of the only surviving examples of their kind. 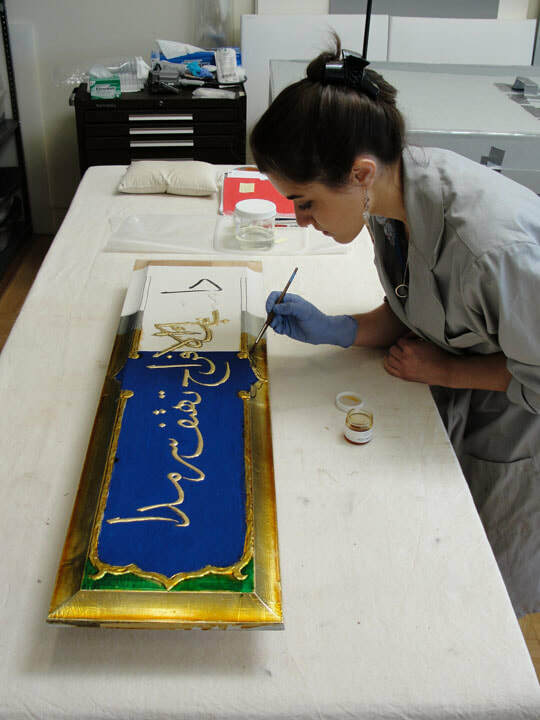 There is a growing group of scholars, conservators, and researchers interested in the preservation of Ottoman painted interiors and traditional craft knowledge. 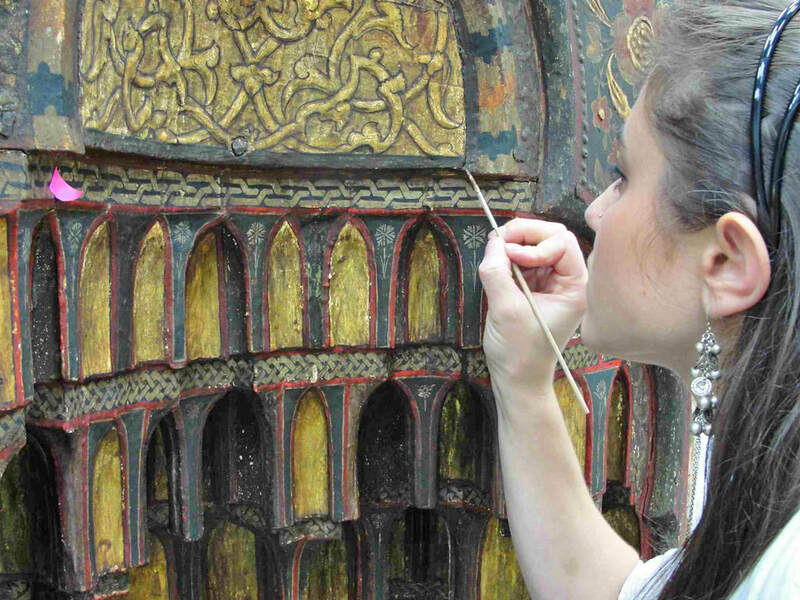 In 2010, the International Institute for Conservation of Historic and Artistic Works (IIC) met in Istanbul, gathering many in this group to share their research and work, including those from Syria, Malaysia, Germany, Hungary, and the United States. 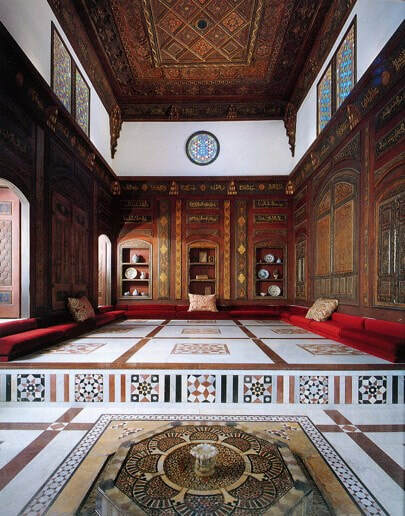 Shangri La's Damascus Room circa 1999. Image courtesy of Shangri La. 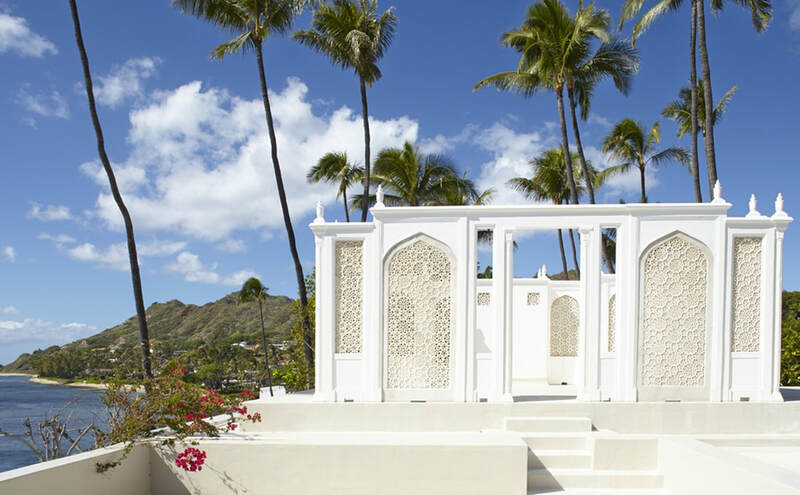 Doris Duke's Shangri La, view from Damascus Room lanai facing Diamond Head. Image courtesy of Shangri La. Filling losses to 'ajami decoration in the Damascus Room at Shangri La, Summer 2008. ​Starting in the Fall of 2009, I moved to New York City where I completed a yearlong internship at the Metropolitan Museum of Art. One of my main projects was work on their Damascus Room. This was a massive undertaking, as it was part of the renovation of the museum's entire Islamic wing. 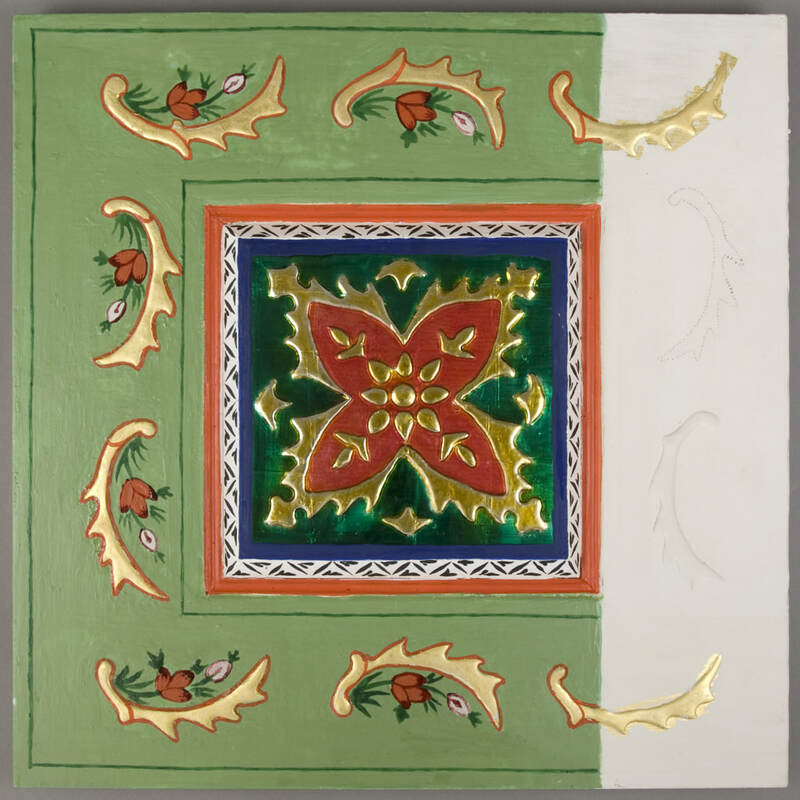 The room was dismantled for the duration of renovations, allowing conservators and curators to examine more closely and treat each individual panel. Part of my work with this team included investigation into the painting techniques and materials, including gesso, metal leaf, paint, and varnishes used in that room specifically. 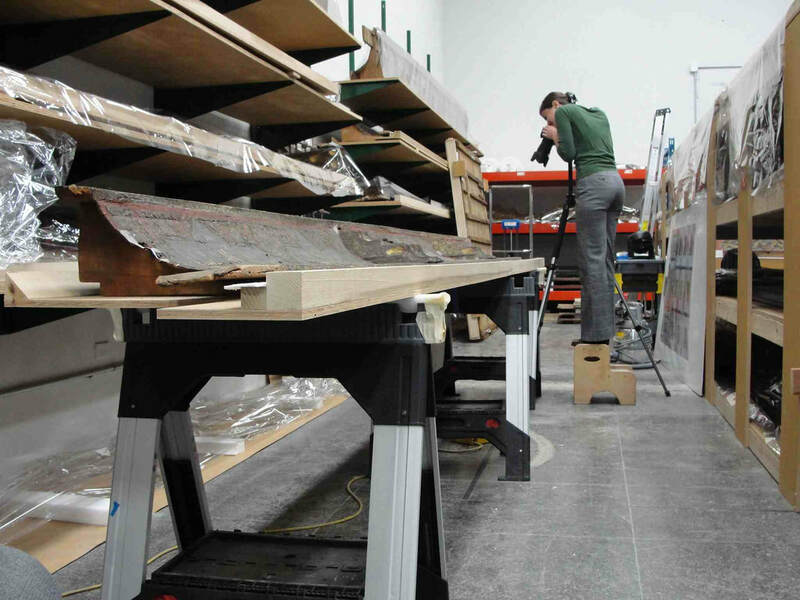 The culmination of the project included two reconstruction panels (see below) made with the materials identified through extensive historical research and scientific analyses and a poster on this research, presented at the aforementioned 2010 IIC Congress in Istanbul. Consolidating Damascus Room masab. Photographer credit: Beth Edelstein. Photographic documentation of cornice element. As is often the case, restoration varnishes are applied atop original decoration layers to restore vibrancy of color and shine. Over time, these varnish layers not only darken significantly, but they become intermixed with the original colored varnishes beneath, making them impossible to remove without disruption of original surfaces. The reconstruction panels were created to illustrate what the original surfaces might have looked like. One can imagine what the spaces overall would have felt like, enriched with so much vibrant color and interplay between matte and reflective surfaces. Baumeister, M., Edelstein, B., Rizzo, A. et al. 2010. "A splendid welcome to the house of praises, glorious deeds and magnanimity." In Conservation and the Eastern Mediterranean. International Institute for Conservation of Historic and Artistic Works (IIC) Contributions to the Istanbul Congress, Rozeik, C., Roy, A. and Saunders, D. (eds), 20–24 September 2010. London: IIC.126–133. Schultz, J., Arslanoglu, J., and Petersen, K. 2010. "The use of ELISA for the identification of proteinaceous binding media from an eighteenth-century Damascene reception room." Poster presentation in Conservation and the Eastern Mediterranean. International Institute for Conservation of Historic and Artistic Works (IIC) Contributions to the Istanbul Congress, 20–24 September 2010. Rozeik, C., Roy, A. and Saunders, D. (eds) London: IIC. 269. Scharrahs, Anke. 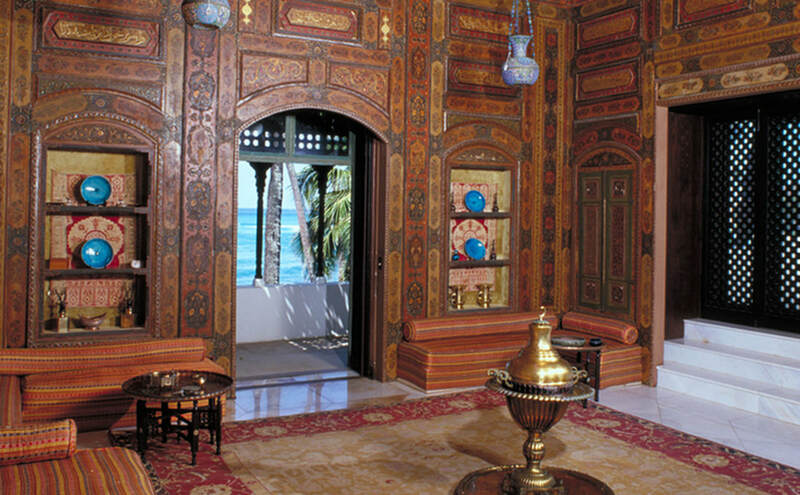 Damascene Ajami Interiors: Forgotten Jewels of Interior Design. London: Archetype books, 2013.